Last week, the Cowboys offense finally found a little rhythm in their 400+ yard performance thanks to Ezekiel Elliott and Dak Prescott. More importantly, it got the Cowboys to a record of 2-2, and though this week’s opponent is 1-3 it feels like they should be much better. This Texansoffense averages over 400 yards per week, mostly by the arm of Deshaun Watson and his fantastic array of receivers. Houston’s problem has been their defense, which is routinely allowing opponents to match those offensive numbers. Can the Cowboys take advantage of Texans’ bad red zone defense? That’s right, the Texans defense is allowing conversions by the bunches in the red zone this season. On 14 attempts, opponents have scored 11 times and the Texans haven’t played a single team ranked higher than 15th in total offense. Houston is 29th with an average of 3.5 red zone trips allowed per game and 2.8 trips are ending in touchdowns. Even the Giants offense went 4-for-4 on Houston. The Cowboys have just 10 trips to the red zone, only five teams have less and two with fewer points scored. Four of the six touchdowns the Cowboys have came in the red zone but the team has eight field goals. It doesn’t help when you also have penalties or the quarterback takes unnecessary sacks. The Cowboys have a real opportunity here but have to stay out of their own way. Can Cowboys defense limit the Texans explosiveness? Over the last two games, the Cowboys have allowed seven plays of 20+ yards or more, two of them were over 40+ yards. They are the third-best defense in the league at limiting these plays with only 13 on the season. The seven in the last two games make up 54% of the season total. 11 of the 13 have come on big passes courtesy of busted coverage by defensive backs. Overall, only three defenses allow fewer yards per play than the Cowboys at 4.9 yards on average. The Cowboys are getting killed a lot on third downs, where they allow the seventh-worst conversion rate of 45%. Overall, of Deshaun Watson’s 92 completions, 19 passes have gone for 20+ yards, that’s 21% of the Texans total offense. Their 20 explosive plays are tied for fourth-most in the NFL, 70% of their passing gains are split between three receivers. 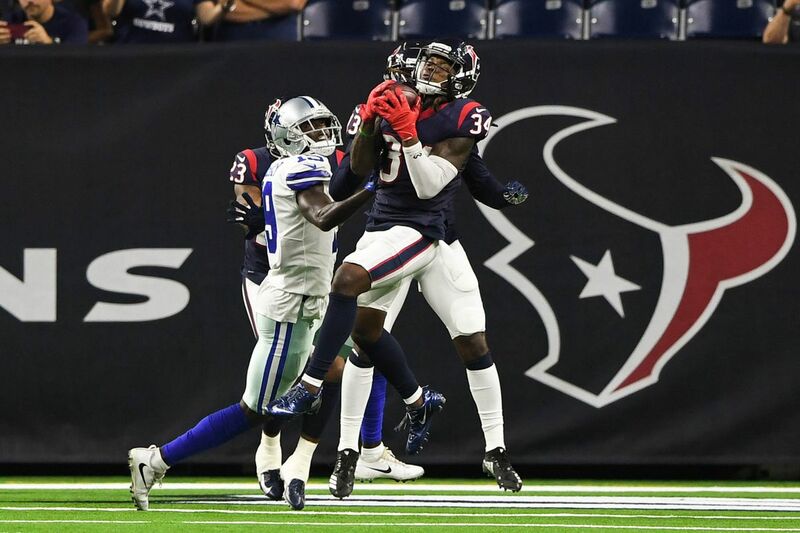 That’s 815 yards between DeAndre Hopkins, Will Fuller, and burner Keke Coutee. Much like the Lions, the Texans present a difficult matchup for the Cowboys secondary. The only saving grace is that Houston’s offense is only converting 40% on third down and is sixth-worst in red zone efficiency at 44%. Which is stronger – Cowboys ability to run or Texans ability to stop the run? Out of the 109 attempts against the Texans run defense, they have only allowed 19 rushing first downs, tied for the eighth-fewest with Washington. They have yet to allow a 100-yard rusher and have allowed only one rushing touchdown. The Texans are only allowing 94.2 yards per game (ninth best). Running backs average 3.5 yards per carry, which ranks Houston fourth in the league, it will be the best run defense the Cowboys have faced. No disrespect intended but the Texans haven’t faced the league’s leading rusher or a Top-10 rushing team for that matter. Though Saquon Barkley only had 17 attempts for 82 yards, he averaged 4.8 yards against Houston. The Cowboys have 30 rushing first downs on just 101 attempts, Ezekiel Elliott accounts for 67% of them. Zeke’s the only running back averaging over 100+ yards per game and his 5.8 yards per carry is a league best. Dallas is also getting an average of 3.9 yards per rush before contact. Can Cowboys’ pass rush wreck the Texans plan on offense? The Cowboys defense ranks third in sacks with 14 on just 126 pass attempts (fifth-fewest). Just about every nine pass attempts, the Cowboys defense is sacking the opposing quarterback. They are also registering pressures every three pass attempts with 42 on the season. The only issue is that nine of Dallas’ sacks have come at home and they average only 2.5 sacks per game on the road. Both Maliek Collins and David Irving will not be making the trip to Houston, which is sort of surprising as they were both thought to be on the track to play. That means that Tyrone Crawford, Antwaun Woods, Daniel Ross, and Caraun Reid will have to step up. Watson has attempted 148 passes (13th-most) but has been sacked 17 times, which is second-most in the league. So, just about every nine attempts, Watson is taken down, perfect timing for the Cowboys. Now, Texans analysts will say similar things as analysts have about Dak Prescott: Watson needs to stop holding the ball! The Texans quarterback is one of just two to have more time per throw than Prescott with 3.16 seconds per Next Gen. Sacks haven’t been the only problem as Watson has been hit a league-high 43 times, that’s a hit for every six snaps. This is the clearest advantage that Cowboys are going to get. The Cowboys and Texans rivalry is typically more one-sided as the Houston crowd will be extremely fired up for this one. A lot of the issues the Cowboys have been struggling with on offense are areas to attack on this Houston defense. The same can be said the other way as well. In the NFL, it’s all about who can take advantage of the matchups, that makes this game a real toss-up.